Amphenol Pyle National Cord Grip Adapter Connectors make sure your cord or cable stays in and everything else stays out. This product is designed for liquid-tight strain relief of cord, cable, and flexible conduit. Available in straight, 45°, and 90° styles, Amphenol/Pyle cord grips are UL listed, and CSA certified. Amphenol/Pyle National Cord Grips provide a complete array of sealing and hardware types. 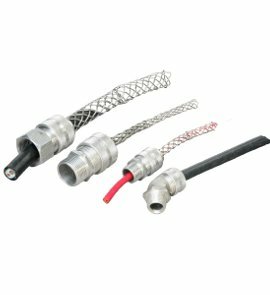 Whether the application calls for a small straight sealing body design, or a larger angles style, Amphenol/Pyle National Cord Grips provide rugged aluminum components to withstand years of service.